They say memory is a funny thing. Well, a killer whale wearing a kilt is a funny thing, too, but it'll still rip you to shreds if that's its call. 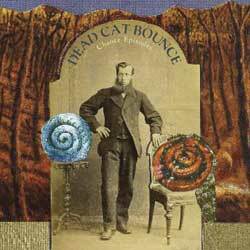 Dead Cat Bounce reedman Matt Steckler took that attitude when writing (and re-writing) the tunes on Chance Episodes, the final product of a process that started in 2003. Steckler's thesis -- which came to being as a commission for jazz' BFF, Chamber Music America -- is that memory has this "haphazard" habit of pulling "unrelated events" from the back of your mind and literally slapping you upside the head with them while you're trying to get through your day. The memories' origins can be anything: Childhood, young adulthood, or just shared experiences. Its ancestry aside, this unexpected introduction lets you "remember things anew, from a creative standpoint." Steckler and his game-changing, keyboard-free sextet wield this thesis like a sculptor with an industrial laser, shaping a startling set that ranges from complex to downright byzantine. The opener "Food Blogger" sets the schizophrenic tone, as Terry Goss' leaping soprano pipes on in a swinging kind of way, and then goes off on this really excited tangent; Charlie Kohlhase (longtime member of big-band provocateurs Either/Orchestra) comes right back with a bari-sax story of his own. Kohlhase has the spotlight all to himself on "Salon Sound Journal," which proves that a piece can be utterly harrowing and still groove. Speaking of harrowing, "Silent Movie, Russia 1995" is either a new soundtrack for a Sergei Eisenstein film or a treatise on winter in North Dakota, but it gives you chills either way, as does the occasionally horrific "Madame Bonsilene." We get a taste of riding the road at 3 a.m. on the night-dark "Tourvan Confessin'," and while "Township Jive Revisited" has a dancing center that's somewhere between reggae and Second Line, Dave Ambrosio's in-the-clear bass solo reminds us that apartheid may be gone from South Africa, but poverty's doing just fine, thank you very much. Episodes is never simple, never insults your intelligence, and every piece has a strength and a root structure usually found in 100-year old oak trees. The horn charts are literally mind-blowing, and have Steckler and his front line going balls-to-the-wall right from the jump. "Living the Dream" may technically be an "up-tempo closer," but the fills behind Steckler's howling alto would make many musicians go permanently cross-eyed. Not all dreams have girls running naked through the high school cafeteria, but some can inspire you to new heights. In that light, Chance Episodes is at 30,000 feet… and climbing. Blog: Listen: Dead Cat Bounce - "Living the Dream" and "Food Blogger"